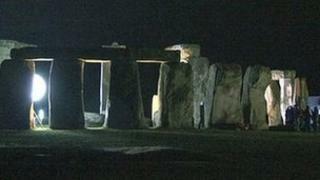 Lighting up Stonehenge at night would turn it into a "theme park", says a senior Druid. Lady Mimi Pakenham from Warminster sparked the idea of illuminating the stones to "really display them" in a letter to a national newspaper. Senior Druid, King Arthur Pendragon, said it would "detract from the very purpose of Stonehenge". English Heritage, which manages the site, said it could be a distraction for nearby traffic. Lady Pakenham, who raised the idea on the letters pages of the Times, said lights would give the monument dignity. "I can't understand why they haven't at least done a trial run of very subtle lighting," she said. "I think very soft illumination, sort of like moonlight, for a few hours in the evening would really display it far more than it is now - where it's looking rather abandoned. "It's all fenced in like a concentration camp, so soft lights for a few hours in the dark of the night - it would actually be the real jewel in England's wonderful, wonderful monuments and buildings." King Arthur Pendragon, battle chieftain of the Council of British Druid Orders, said: "The place is supposed to be dark and broody - that's part of the mysticism of Stonehenge - and illuminating it would only detract from its very purpose as a sun temple. "It's not designed to be illuminated at night and in my opinion it smacks of theme park Stonehenge which is everything I stand against." According to English Heritage, Stonehenge was lit up at night for a period in the 1970s and early 1980s. "But that practice was stopped due to an increase in road accidents caused by vehicles slowing down to observe the monument," said a spokesperson. "As there is even more traffic today on the A303, that risk cannot be ignored."